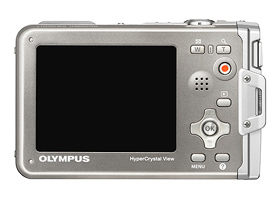 Olympus Imaging Corporation is pleased to announce the µTOUGH-8010 compact digital camera that incorporates all of our most powerful “toughness” features. Waterproof to a depth of 10 metres, shockproof*2 against falls from as high as 2 metres, and freezeproof*3 at temperatures as low as -10°C. In addition, the forces applied to the surface of the body were thoroughly analyzed to achieve a resistance to loads up to 100kgf*4. This camera boasts a stylish design, outstanding imaging performance. Release is scheduled end of February 2010. Olympus’s µTOUGH Series of compact digital cameras feature a waterproof, shockproof and freezeproof design that assures reliable, high-quality shooting under conditions that ordinary cameras would be unable to endure, such as underwater or in cold winter conditions. From the tranquil to the turbulent, whatever the conditions, whatever the situation, this camera assures great results, giving users the opportunity to expand their enjoyment of photography. 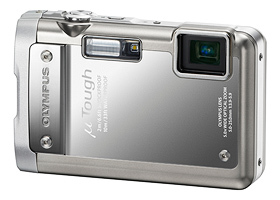 Lens barrier: Only Olympus gives you a Tough camera with a retracting metal barrier. Double-lock mechanism: New Sliding lock secures a lid not to open easily. *1 JIS/IEC protection class 8 (IPX8) equivalent (our in-house test condition). *2 Under Olympus in-house test condition. *3 Number of recordable pictures is reduced in low temperatures. *4 Kilogram-force is the unit for measuring force extended on a body. Under Olympus test condition. *5 The image stabilization effect varies depending on shooting conditions. *6 The area available to the user is 1.6GB (including Software and Manual). *7 Compatible with Windows OS only. *8 JIS/IEC protection class (IP6X) equivalent (our in-house test condition). *9 Number of effective pixels.